Everyone seeks for all that life might offer. In this search, many grasp for individual moments of fulfillment and consequently live in a never-ending quest. Surely, life is more than chasing moments. The question is this: “Is there a life worth finding?" Join me on this journey of discovery, and find out for yourself! This book is a “must read” for every Christian and for anyone who is seeking a more meaningful existence. Writing in an engaging style, Malone has set forth the essentials needed for a mature Christian life. His basic theme is that the only true existence is one fully surrendered to and guided by the Creator who designed it in the first place. Malone is especially concerned about those who claim to be Christian but live an existence more conformed to the ways of the world than to God. Throughout the book he warns that such an orientation is to follow the broad path that leads to destruction and to miss the narrow path that leads to life. Malone treats numerous Biblical texts that illustrate his themes. His interpretation of Scripture is consistently sound and clearly presented. He has a knack for illustrations, especially for taking Biblical metaphors and parables and retelling them with modern examples. He consistently draws from his own personal experiences—his farming, his 8-year-old grandson, his golfing, his dogs, and the like. This makes for engaging reading, even when the subject matter is dealing with profound issues of life and death. Appropriately, the author’s final chapter deals with the concept of zoe, the Greek word used in the Gospel of John to speak of spiritual life, life in God as opposed to mere existence. In John’s Gospel, zoe is the only true life there is, and this is true of this life as well as that to come. One who does not have this zoe-life is already dead. This is Malone’s theme throughout the book: one who does not have the zoe life that comes from God and lives in God has no real life but simply exists. The world is full of these mere “existers,” in the pews as well as on the streets. They need to read this book. Author of Acts, New American Commentary (Nashville: Broadman Press, 1992). Paul and His Letters (Nashville: Broadman/Holman Publishers, 1999). Perhaps you are craving something deeper than the life you have experienced so far, something more than just chasing moments, something with quality and eternal significance. In this book you will find that adventures beyond description and life in all its fullness are waiting for you, if you are willing to relinquish control of your life to someone who can manage your life better than you can—to God, who wants to have a personal relationship with you. Ed’s analogies to farming, mountain trails, golf, and his dogs make this book real, practical, and easy to apply to life’s journey. The questions for reflection at the end of each chapter make it a useful book to study as a small group. Jean and her husband Tony along with their three children are church-planting missionaries in Paraguay with S.I.M. Through careful Biblical exposition and narrative clarity Chasing Moments invites us to rest in God’s presence, wonder at His majesty and live our lives with eternal purpose. With the wisdom of a Pastor-Farmer, Ed Malone takes us to his farm in Tennessee where we walk freshly tilled earth, lift bales of sweet dry hay, return a lost calf to its mother and welcome a young boy into manhood all with an eye toward better understanding God’s eternal purpose for our lives. A book for all ages, Chasing Moments will remind you of who you are in Christ so you can live, with purpose, the days that are to come. 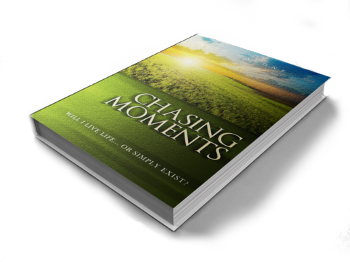 Chasing Moments invites you to enter into the Kingdom of God. It is an invitation to choose the narrow gate and walk with the Savior, to pursue a deeper, fuller, more meaningful Christian life. In presenting this invitation, Ed Malone follows the example of Jesus, the master teacher, by using parables, analogies, and engaging stories from his life on the farm. From wrestling a calf in an ice cold creek to fighting the weeds that would consume a hay field, Ed uses everyday stories from the farm and other parts of his life to illustrate the principles of kingdom living. He masterfully presents the seemingly paradoxical concepts that “you can only have life by dying to yourself” and “true freedom is gained only by becoming a servant and slave to the King.” I have taught in the classroom for years and Ed’s teaching style is engaging and effective. This book would be beneficial for both new and mature Christians desiring to deepen and enrich their life in the Kingdom. The end of chapter questions and challenges also make this a great book for group study in a Sunday school class or Bible study.